Google wants to make it easier to find your ideal job. 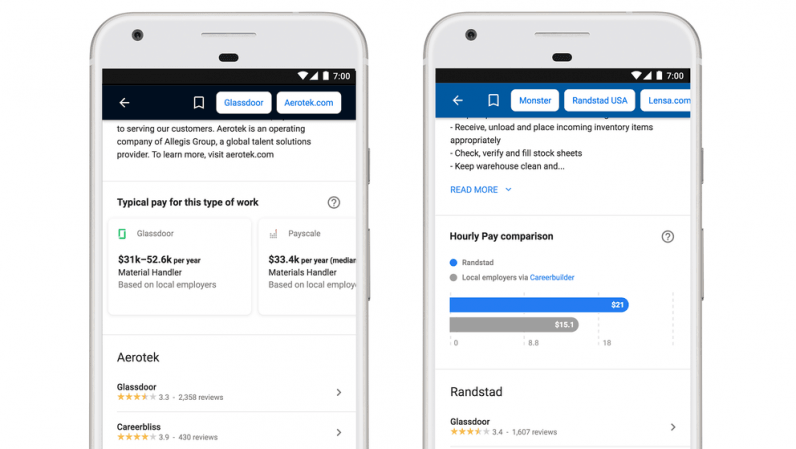 The internet giant is introducing a line of improvements to its Google for Jobs platform. Among other things, the new features will offer users more detailed career postings, including salary comparison stats, improved location settings, application categories – and a couple of weeks from now, the ability to save individual listings. To provide accurate stats, the Big G will source data from popular careers platforms like Glassdoor, PayScale and LinkedIn. Job listings that already include a salary indication will show a comparison to the estimated remuneration range for the position in question. Google has also revamped its location filters to make it easier for users to see vacancies exclusively within their preferred range of distance – starting from two and going all the way up to 200 miles. One thing I find especially handy is that, in the event that the same vacancy is listed on more than careers platforms like Monster or CareerBuilder, Google will give you the choice to select through which website you want to apply. This means you won’t have to fill in your working experience anew each time you apply for a role. Unfortunately, it appears the service will continue to be limited strictly to the US.